The Don Valley Parkway in the 80s or early 90s, looking south to the older Eastern Avenue Bridge. City of Toronto Archives, Fonds 200, Series 1465, File 536, Item 7. There’s an old Catholic saying: Christ called us to the Kingdom. We answered with … the Church! Not every public project turns out quite the way that it is planned. It’s hard to understand—at a distance of half a century—just how optimistic and even joyous a cocoon of rhetoric encased the Don Valley Parkway at its birth. Telling that story illustrates how one day’s Utopia can devolve into another’s Waste Land. That telling can reveal how the thinking behind that devolution is with us still. “[V]alleys like the Humber and Don are not spoiled by arterial highways but beautified.” Well according to former Metropolitan Toronto Chair Frederick G. Gardiner anyway. Robert Caro writes in his Pulitzer–prize winning biography of Gardiner’s American role model, Robert Moses, that his subject “wanted the parkways to be broader and more beautiful than any roads the world had ever seen, landscaped as private parks are landscaped so that they would be themselves parks, ‘ribbon parks,’ so that even as people drove to parks, they would be driving through parks.” This attitude was typical of the mid-20th century, as people were increasingly driving to get to work, but also for pleasure. Taking a road trip became a vacation. Driving without a destination was an introspective journey and symbolized freedom and hope. These days, driving crammed on to busy, crumbling roads in Toronto, it’s hard to imagine that back in the 1940s, people spoke glowingly of the beauty of parkways and wanted roads through natural areas—including the Don Valley. 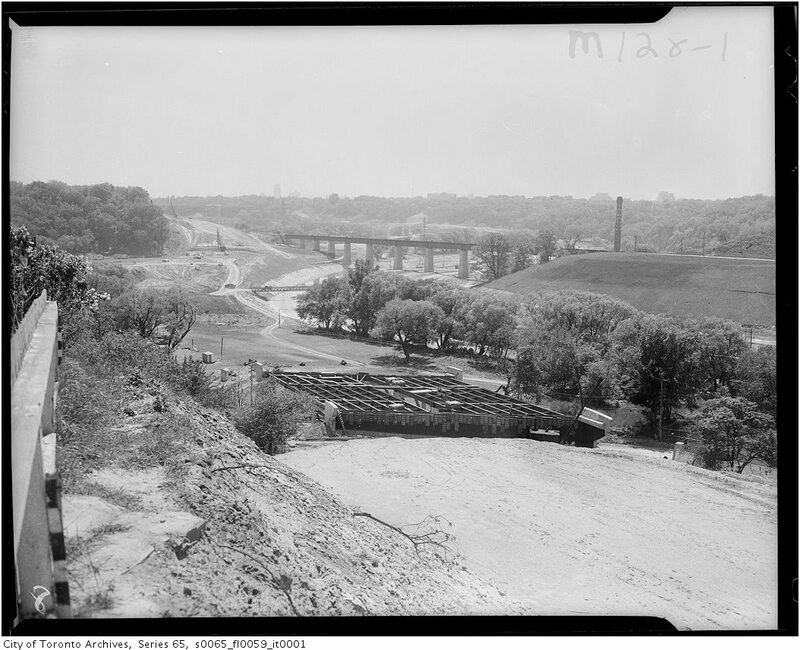 Although Moses’s pro-parkway views are well known, the DVP came about through the result of a popular referendum. Call it a New Year’s Day hangover, call it being misinformed: the fact remains that on January 1, 1946, Toronto voters handily approved the Don Valley Traffic Artery. However bizarre the rhetoric of the time may seem to us today Parkway as beautification? Parkway as park?—that’s what Toronto voters so enthusiastically embraced. We can see now that the DVP marks the post-war automotive age’s high-water mark in Toronto, an era that would falter with the 1971 cancellation of the Spadina Expressway.The cultural and urban planning gurus of the earlier era that brought us the DVP proclaimed the virtues of automotive parkways and limited-access transportation corridors. 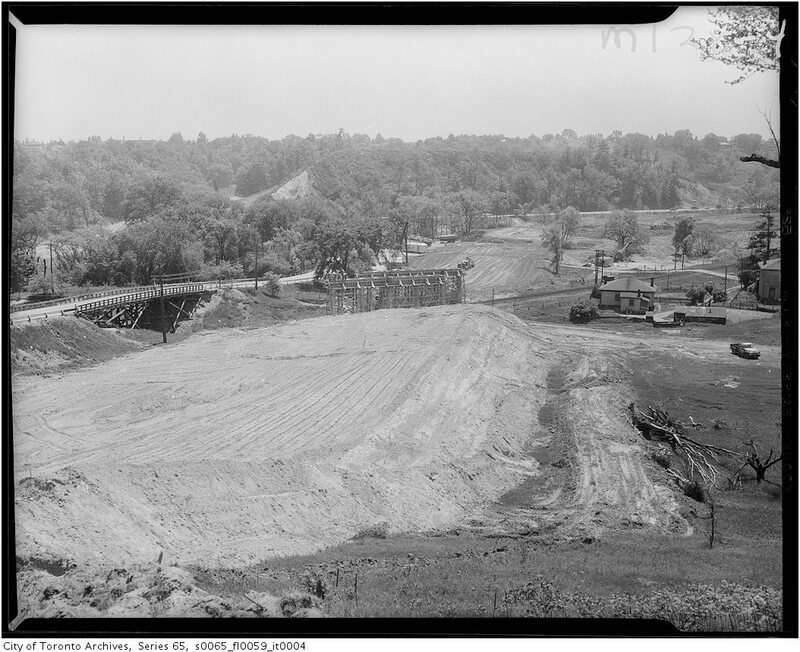 The Don Valley Parkway under construction in 1959. City of Toronto Archives, Finds 220, Series 65, File 59, Item 1. [The parkway] humanizes the highway by carefully following and utilizing the terrain, rising and falling with the contours of the earth, merging completely into the landscape. The road is laid into the countryside, grooved into it between gentle green slopes blending so naturally into the contiguous land that the eye cannot distinguish between what is nature and what the contribution of the landscape architect. Giedion’s almost painterly perspective melds landscape and built environment into an indivisible and enlightened whole. Air views may show the great sweep of the highway, the beauty of its alignment, the graceful sequence of its curves, but only at the wheel of the automobile can one feel what it really means—the liberation from unexpected light signals and cross traffic, and the freedom of uninterrupted forward motion, without the inhuman pressure of the straight-line layout pushing one on to dangerous speeds. Full realization is given to the driver and freedom to the machine. Riding up and down the long sweeping grades produces an exhilarating dual feeling, one of being connected with the soil and yet of hovering just above it, a feeling which is like nothing else so much as sliding swiftly on skis through untouched snow down the sides of high mountains. Giedion’s prose about the parkway is echoed elsewhere. Take, for example, the work of the influential town planner Jacques Greber, whose work had a significant effect on the profession in the U.S. and Canada alike. The Don Valley Parkway under construction in 1959. City of Toronto Archives, Finds 220, Series 65, File 59, Item 4. When the Metro Planning Commission replaced “traffic artery” with “parkway” in 1955, it upgraded the planned road conceptually and rhetorically. “Parkway” filled a semantic niche well above anything conveyed by “traffic artery.” A current online dictionary indicates that “parkway,” now covers any old highway with a planted median. It wasn’t always that way. The Oxford English Dictionary defines the term—originating in the U.S. and first recorded in 1875—as “[a] broad arterial road planted with trees; an open landscaped highway or boulevard.” It designated complex-usage, tree-lined boulevards linking urban districts along radials open to pedestrian and vehicle traffic alike. Post-World War One U.S. usage began to employ the grand name for the mean thing: limited-access roadways reserved for automotive traffic alone. By 1929, As Elizabeth Macdonald observes in the 2002 Journal of Urban Design, the old “parkways” had become “boulevards” in town-planning speak. The parkway was now “a landscaped, limited-access highway built outside urban areas, intended to function as a pleasure drive for automobilists and not as a framework for residential development…the much wider, picturesquely landscaped malls were for scenic viewing rather than pedestrian or bicycle use.” An automobilist version of the parkway, with its grasp of the new relationships between modern technologies in autos and in highway construction had heightened the parkway’s appeal. That is the vision that Toronto voters bought into in 1946 and what the Planning Commission handed them in 1955. Today, when disillusionment makes “parkway” an antithesis to “freeway,” when the simple act of designating a portion of an Interstate as a parkway can mollify opposition to the road, we have to strain to grasp that this has not always been the case. Two texts tell us the story. The eye-catching graphics of the 25-page, spiral-bound document about the Don Valley Parkway the Fenco-Harris engineering firm plunked down on the desks of Metro Council members in 1955 replaced the functionalist “traffic artery” concept with a kind of urban pastoral. The confident modernity of the new parkway in the Fenco-Harris document contrasts sharply with a government document issued five years earlier. Compared with the slickness of the DVP brief, a sprawling, roughly 532 page, discontinuously paginated “Don Valley Conservation Report,” compiled by the provincial Ministry of Planning and Development seems like a message in a bottle from a different, quieter world. History, geology, land use, soil composition, forestry, wild life, recreation, pollution, park land, and much more appear in its table of contents. A reader quails at the wealth of information, in prose, photographs, maps, and charts. Nothing is missing from that document except a dynamic engagement with the actualities of the time in which it appeared. Juxtaposing those two texts brings to mind nothing else so much as Alex Colville’s now-emblematic painting of the horse galloping toward the oncoming, invincible train. New Year’s Day, 1946 had shown that some transportation corridor was going to impinge upon the valley treated in the government document. Whether by accident or design, nothing in the ministry document acknowledges or notes that brutal fact. What the ministry viewed as an area teeming with wild life and recreational potential, Metro Toronto’s master builder and power broker Gardiner had scorned bitterly as “a place to murder little boys.” There doesn’t seem to be any basis for his bizarre remark. Gardiner dreamt of a road “winding through inaccessible land.” Columbus-like, the leaders of the automotive society gazed upon virgin territory lacking any claim to autonomy or sequestration. Bridges over the Don River, looking just north of the Gardiner Expressway in the 1980s or 1990s. City of Toronto Archives, Fonds 200, Series 1465, File 58, Item 8. The very features endearing the valley to those who knew it marked the site for highway development, as both the highway engineers and an astute journalist recognized. What was to the engineers, “[A] rather singular situation of limited interference to existing facilities” struck journalist Ron Haggart as “too good.” The valley is steep, lying well below street level, removing the need for urban over- and underpasses. Bridge crossings had long since been placed along the traffic arteries traversing the valley. The aftermath of Hurricane Hazel in1954 had instigated flood control efforts in the valley, thus reducing the threat that the river had posed to highway maintenance. The proposed route encountered very little in the way of residential development. Nothing costly loomed between the existing corridor and the thrust of the new highway, or rather parkway. Driving south along it even today, the highrise towers are on the left. On the right, there are trees, bushes, streams, cyclists, pedestrians, and all those landscaping features: “Full parkway character fitted to existing landscape,” as the report promised. One theorist had invoked utility, safety, beauty, and economy as the principles governing highways; Fenco-Harris asserted that utility, economy, and geometry (whether the road was to be straight or winding) marked their plans. 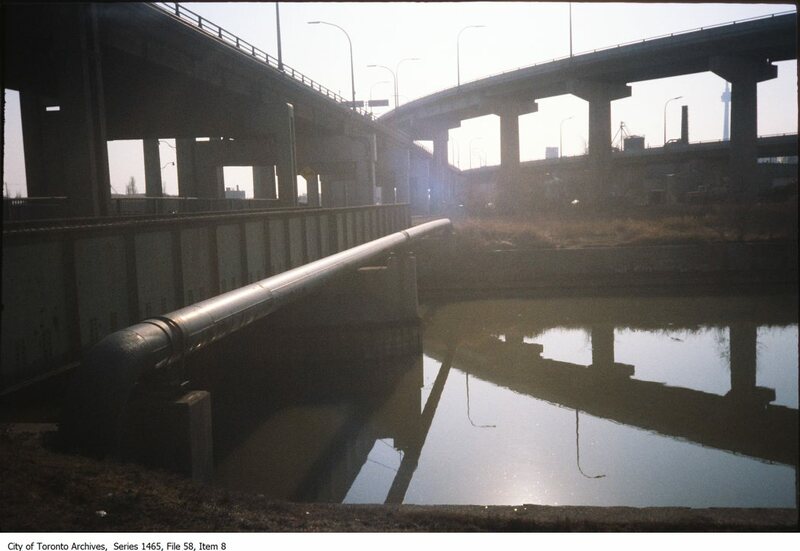 The DVP was pitched in the then-familiar cultural framework, that of the pastoral highway. Urban and wilderness parks could be viewed as places of retreat from the strains of urban life, as sacred spaces that refreshed the soul. By the same logic, parkways could siphon for themselves a portion of that transcendental value. As opposed to highways, parkways gave the impression, with their curved routes and artfully sited and adorned underpasses and overpasses, that they modified nature, rather than destroyed it. Parkways now remind us of the verities that Stalinist public architecture lunged toward. The grandiose Stalinist buildings in Moscow—still arresting to a visitor’s eye—with their spires, clock towers, detailing and warm, colourful cladding spoke in their time of a new Soviet Man, who nonetheless absorbed within his transformed environment a modicum of the sweetness of a (ruthlessly) obliterated past. The parkway spoke of an automotive artery that conveyed nostalgia for the once-autonomous natural environment that had preceded it. Strange as it may seem, a number of present-day observers continue to describe the parkway using similar language to the original theorists. Using the language of art criticism, these writers continue to provide us with an aesthetic response. 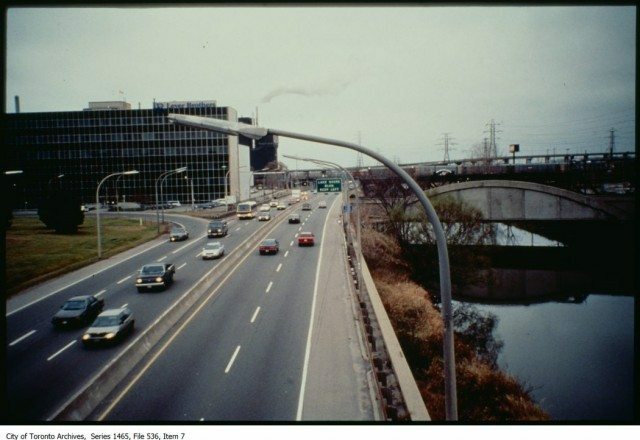 If we can still, as Toronto architect and writer Graeme Stewart puts it,envision the DVP as a “period piece…one of the most modern experiences in the city,” this is because the road grew out of a culture which appreciated a certain variety of public highway. Stewart’s useful book Concrete Toronto continues his descriptive account of a journey along the DVP by noting its “[r]olling topography, a curving concrete highway and dozens of high-rise apartment buildings poking out amid the forest canopy [that] create a linear essay in modern ideals.” In a similar fashion, observers, such as Whiteson and Gage, writing in their book The Liveable City, link the urban phenomenon of the Don Valley Parkway with the most typically modernist of visual experiences: film. “Metro’s most cinematic freeway,” a “widescreen epic [that] fades out into the distracting detail of downtown,” as they put it. Of course, this variety of critical viewing lacks any firm connection with actual experience. This mode of description rests upon a sharp distinction between object and viewer, an ideal beholder who stands removed from what they are viewing. Theatre critics write easily of breaking down the fourth wall, of erasing the boundaries between player and theatre-goer. This project, one that preoccupies many of the playwrights of our time, seems to have passed by those purporting to describe our transportation networks. There is a reason for this: there is no such thing as a detached audience. You don’t buy a ticket to the DVP. You try to drive it, probably because you have to. The only way to experience fully the object is to be driving upon it, to be absorbed within its multifarious protocols and demands. Anyone in that real, non-idealized audience is absorbed not simply in the mastery of the technological conditions necessary for the use of the road. Any member of that non-idealized audience must also devote their full attention to the discipline, concentration, and self-restraint necessary for the efficient, lawful and, above all, safe usage of the road. Your seat for watching this play is dynamic and, at times, perilous, rather than stable. From its beginning to its problematic present, any engaged evaluation of the DVP and its meaning is accomplished through the usage of an idealized discourse that cannot encompass the the experience or the contexts in which that experience takes place. The necessarily lumbering and detailed description of natural, geological and social aspects of the Don Valley environment (the Ministry document) crumples in the face of the slickness of the Fenco-Harris pitch. Laboured taxonomy always loses when it is pitted against functionalist logic. We may scratch our heads in the face of the boundless optimism inherent in the kind of talk that helped saddle us with the DVP, but we are the authors of that perplexity. That detached, objective, and above all aestheticized way of describing the implementation of brutal technology is still with us. Did you local history journalism? Support the award-winning journalism by Historicist by becoming a Torontoist patron for only a few dollars a month. Get great perks and fund local journalism that makes a difference—join now.